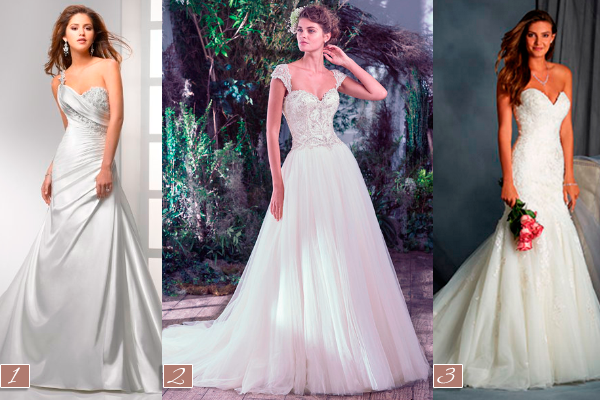 Why Is the Fit and Flare Wedding Dress the Best Choice? 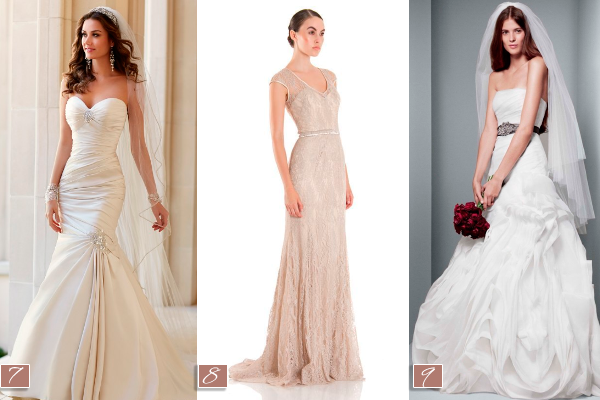 Who Wore a Fit and Flare Wedding Dress? 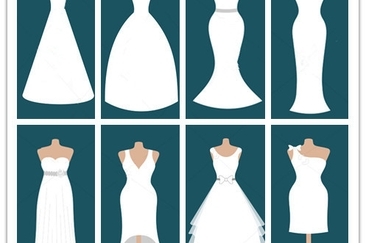 When start your wedding dress shopping, the bride should keep in mind how she wants hers dream gown looks like, otherwise the different shapes and sizes will make you confused with what it’s best for you. Choosing a silhouette that will highlight your assets and hide your less-favorable traits is the basic. 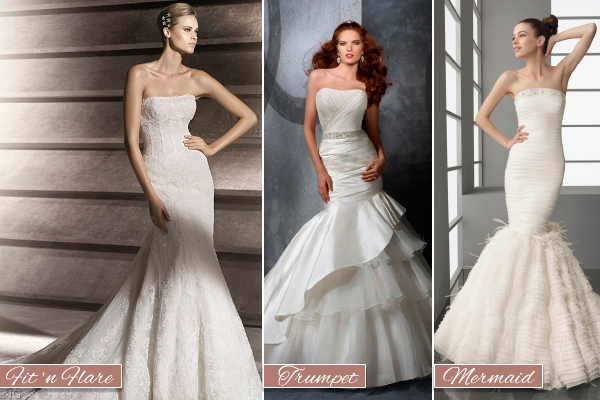 Today we are going to talk about a very popular silhouette: fit and flare wedding dress. 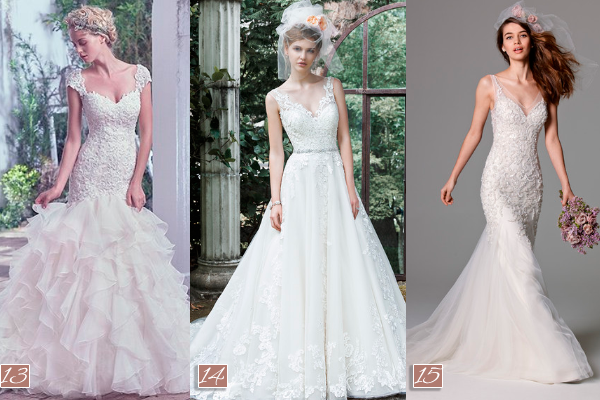 Most brides dream of a dress that makes her look like a princess, and the sweetheart neckline is most likely the favorite one, but the silhouette that makes almost every woman looks amazing and feel comfortable is the fit and flare wedding dress. What is that? Well, this term is used to describe any dress that fits tight on the top and gradually flares out. Most of the times the fit and flare dresses are confused by the mermaid and the trumpet dresses, because they look really similar, but the way they feel on the body is very different. The trumpet silhouette is closely tight from the top to the mid thigh and then flares out, the mermaid only flares at or below the knee, and that is why the fit and flare is the best silhouette to wear on your wedding day. It is more comfortable since it is only tight on the top and flare out right below the hips, offering the loosest fit on the legs, so it makes it easier to walk and dance. This type of silhouette goes with almost every body shape but it looks better on women with large hips. Theses dresses contour the curves beautifully and if you are looking to create a slimming effect, go with diagonal draping. 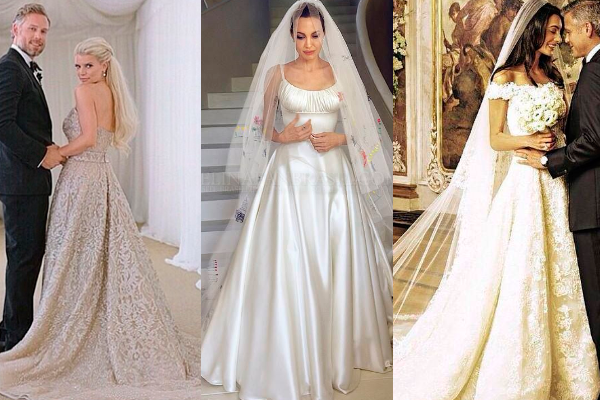 A lot of celebrities choose a fit and flare silhouette to get marriage, here are some of them: Ivanka Trump, Chelsea Clinton, Victoria Beckham, Jessica Simpson, Angelina Jolie and Amal Alamuddin. 1- The sleekness of Demir stretch satin, coupled with Swarovski crystal embellished corded lace makes for a grand entrance, it is pure sophistication and charm. 2- One of Maggie Sottero designs; it has Swarovski crystals, pearls, and embroidered lace, adorning the fitted bodice and sweetheart neckline before flowing into a dreamy tulle ball gown skirt. 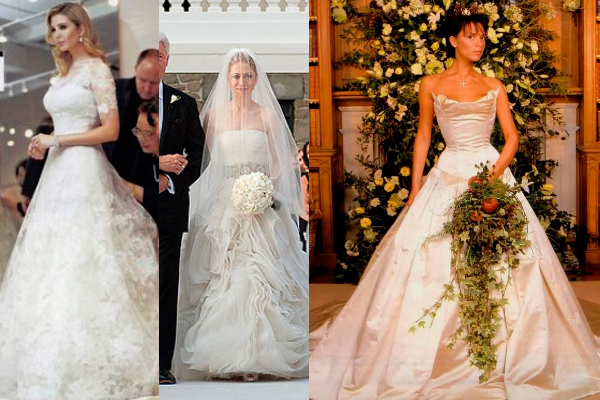 3- This one has a sweetheart neckline with full length skirt, its embroidered lace cascades down the flared, layered skirt and into a chapel train. 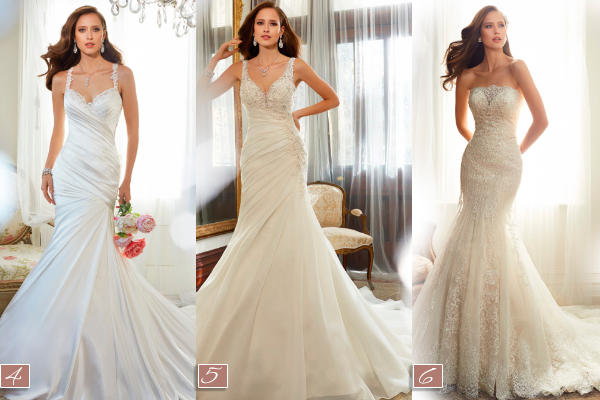 4- Gorgeous lace trims the sweetheart neckline and shoulder straps. Asymmetrically draped shimmer satin flatters the torso and flows into the full skirt of this fit and flare silhouette. 5- A curved V-neckline framed by crystal hand-beaded scalloped lace is the main feature of this sleeveless fit and flare crystal organza gown. 6- Scalloped lace highlights the strapless neckline, featuring a semi-sheer modesty panel, while lace and beading follow the curve of the body to enhance a woman’s silhouette. 7- This strapless Dolce satin wedding dress from the Stella York collection features gorgeous Diamante embellishments at the bust and knee. 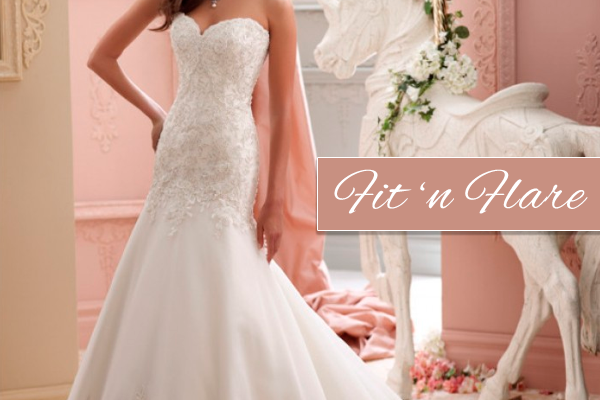 8- It has illusion sweetheart neckline, cap sleeves, satin piping, matching belt and flared skirt with slight train. 9- This spectacular fit and flare wedding dress is designed with hand-cut bias organza so each gown has a unique, organic look. 10- Stunning fitted lace bodice, accented with Swarovski crystals, and voluminous tiers of tulle and Chic organza layered throughout the skirt. 11- Romantic and sophisticated, this fitted bodice, adorned with beaded floral appliqués and Swarovski crystal details, falls into a voluminous layered horsehair edged skirt. 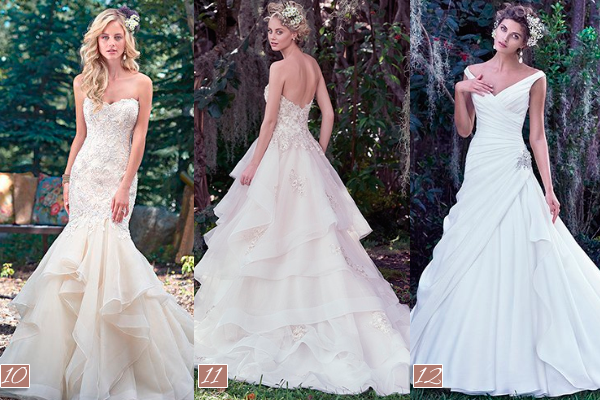 12- This Atlie organza A-line wedding dress exudes femininity with a romantic portrait neckline. 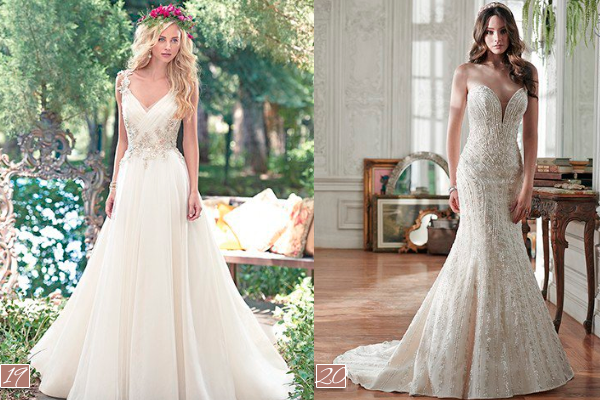 13- Intricate lace and beaded drop waist bodice, flaring into a layered tulle and Chic organza skirt. Finished with covered buttons over zipper and inner corset closure. Detachable lace cap-sleeves are sold separately. 14- This dress has floral lace appliqués drifting down a tulle skirt, an elegant illusion V-neckline, and a glittering Swarovski crystal belt. 15- This gown of soft netting and tulle features beaded motifs throughout the bodice dripping down onto a flowing skirt and finished with crystal buttons down the back. 16- An intricate lattice lace with a double keyhole back and illusion tulle neckline adds a modern twist to this classic fit and flare wedding gown. 17- Venice organza is artfully draped into this luxurious fit and flare wedding dress, featuring a decadent embroidered bodice with Swarovski crystals and romantic sweetheart neckline. 18- This dress has Swarovski crystals and sweetheart neckline. The look is completed with a dramatically full Marquice organza skirt. Finished with crystal buttons over zipper and inner corset closure. 19- Beautifully detailed with embroidered lace and delicate pleated tulle, the fitted bodice of this romantic A-line dress cascades into a flowing tulle skirt, adorned with Swarovski crystals and floral inspired lace appliqués at the waist and shoulders. 20- Adorned with decadent pearls and shimmering beading raining down the bodice and skirt. 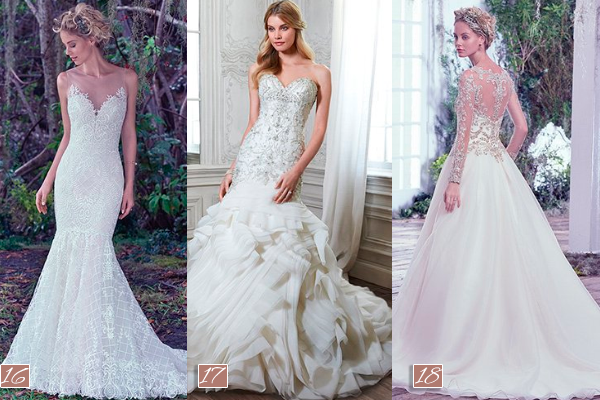 Great wedding dress shopping tips will cut your boutique trips and disappointments for your dress hunting. 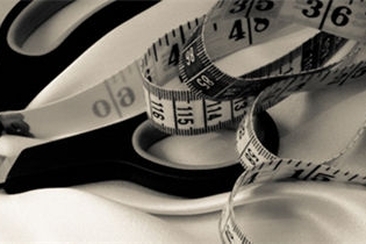 Find out how to make the smoothest time of your dress shopping.